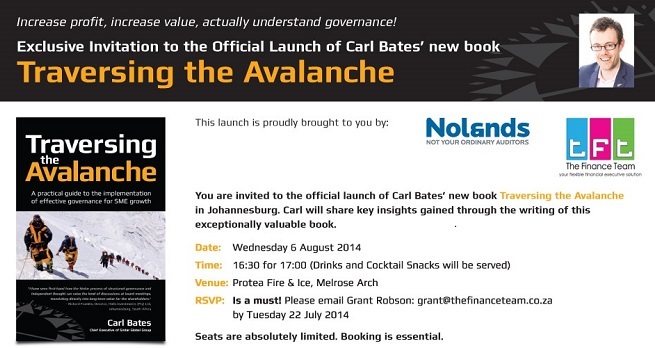 Book Seats for Traversing the Avalanche Book Launch! Seats are limited,booking is essential. Carl Bates is a global entrepreneur, speaker, author, mentor and director. He is a dynamic thought leader from New Zealand and is considered an international expert on business growth and the education and implementation of governance for SMEs and privately held companies. Carl is an experienced indepent director and chairman with great insight into the operation of companies and how they can create long term value for stakeholders, clients and shareholders. As founder and chief executive of Sirdar Global Group, he is world renowned for this practical understanding of governance in the SME sector and is constantly sharing his knowledge of the subject.